I'm a member of the Cupcake Polish fan group and was fortunate enough be able to order the group custom that was being offered. It's a beautiful Sea Green shade but when in bright lighting it looks more aqua. It's amazing how polish can look so different under different lighting, isn't it? Anywho - It's a beautiful shade and the formula is excellent as always so I wanted to share it! After wearing it a bit, I decided to try out a new plate and stamper so I did this! I used the middle design on plate QA6 from ebay and Konad black to stamp with my new Candy Head stamper head and then embellished the design with tiny black gemstones. Beautiful. I love the stamping on it. 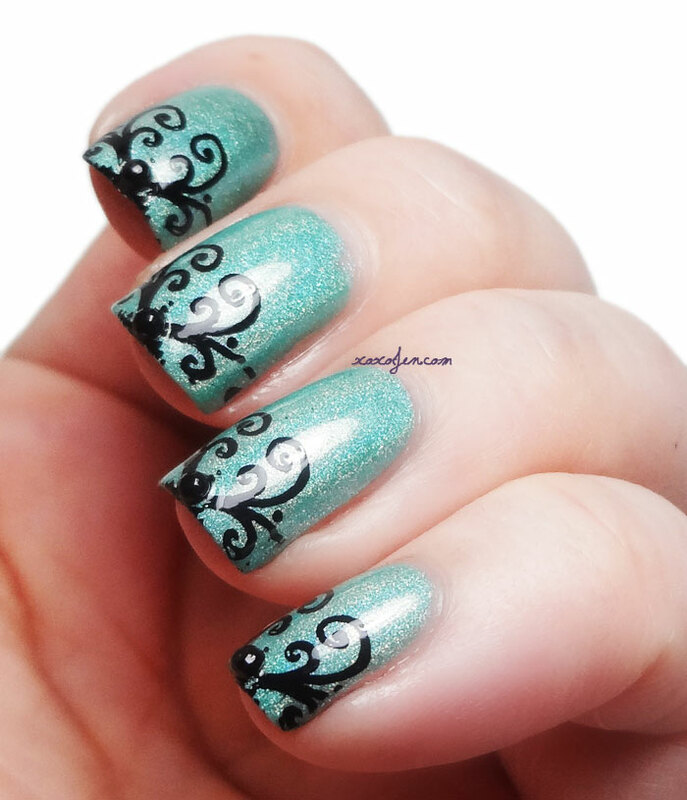 Gorgeous color and I like how the stamping is concentrated on the tips. Thanks Lisa! I used only half of the image on each nail to get that effect. Jen, I like how you embellished your stamping with gemstones. You've given me some great inspiration! Aw I'm blushing! Thank you Cat!